53-year old Bhupendra Chavan from Surat was in the midst of a wedding in the family when he suddenly experienced loss of vision with bouts of pain in the head. In the hustle-bustle of the wedding, Chavan initially ignored the pain but the intensity rose soon. Unlike the much-seen vision problems, Chavan was having problems in seeing sideways. His peripheral vision was lost to a great extent. As the vision loss became more acute, coupled with increase in pain, Chavan consulted a local doctor. Through the course of investigations, the Physician suspected it to be a neurological condition, but was unable to proceed with the treatment as they were ill-equipped. The Physician was advised to consult Dr Sunil Kutty, Neurosurgeon at Fortis Hospital in Vashi at the earliest. Chavan travelled to Mumbai and consulted Dr Kutty immediately, on his advice; he was admitted to the hospital on 6th January. Investigations into the patient’s medical history and further tests were done to diagnose the exact problem. Amongst others, Hormone Profiling Test and Perimetry Test were conducted to investigate the case of discomfort. MRI and CT Scans were conducted to rule-out tumors but the outcomes of these reports revealed that there was a tumor in Chavan’s Pituitary Gland. 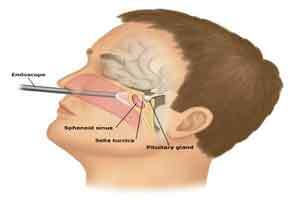 “Pituitary Tumors are abnormal growths that develop in the Pituitary Gland. These cause excessive production of hormones that regulate important bodily functions. Pituitary tumors can grow to large size, compressing important nerves and arteries at the base of the brain. These restrict normal functioning of the Pituitary Gland, causing it to produce lesser levels of hormones. A vast majority of these tumors are non-cancerous growths (Adenomas). Adenomas remain confined to the Pituitary Gland or surrounding tissues and don’t spread to other parts of body. The complications arising from Pituitary Tumor can range from blindness to painful conditions like Male Galactorrhea(lactation in men),” informed Dr Kutty. “Surgical tumor removal often reverses Endocrine problems and restores hormonal balance. Thankfully, medical science has invented innovative ways and the patient was treated innovatively,” added Dr Kutty. The patient is a relieved man now, with his vision restored, he is back to his normal self. An elated Chavan said “I am fortunate to have been referred to Dr Kutty, who reassured me that I’ll be healthy again. I think that right surgeon and right hospital do make a whole lot of difference, Dr Kutty’s expert intervention has helped me come back to my family as a healthy man”.